One proposal to replace HDMI is called Super MHL, backed by Samsung, Sony, Toshiba, Nokia and chip-maker Silicon Image. It's aimed at 8K video, a new format not expected for several years that offers pictures with 16 times the resolution of today's best high-definition TV. It's based on the MHL standard already in existence, but one you've probably not come across. 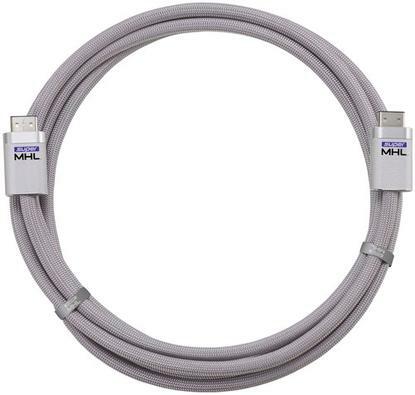 MHL sends video over the USB connector on a phone to a flat-panel display. If the display also has MHL support, a straight cable into the HDMI connector is all that's required, but TVs without the standard require a more expensive adapter. The technology has advanced through several versions, moving from conventional high-definition video to 4K video, which is four times the resolution of high-definition video. Each time it's been upgraded, it's retained reliance on the HDMI connector present on all TVs today, but that all changes with Super MHL. The HDMI port can't carry enough data or the accompanying multi-channel audio for the sort of services envisaged with 8K broadcasting, thus the need for a new connector, said Rob Tobais, president of the MHL Consortium. It will be able to carry 8K video at up to 120 frames per second -- twice the number of images per second of today's high definition, which should mean fast-moving video appears smoother. Most consumers still haven't moved beyond high-def, but the electronics industry is always looking for ways to sell more TVs, so there are already plans to replace next-generation 4K with next-next-generation 8K. Leading the pack is NHK, Japan's public broadcaster, which has been developing 8K for years and plans to begin domestic broadcasts in time for the Tokyo Olympics in 2020. NHK was the first broadcaster in the world to begin regular high-definition broadcasting when it launched a daily, hour-long satellite service in 1989.